Planes, trains, buses and automobiles all bring you to, and through, France's Loire Valley. France's Loire Valley is well served by public transportation, though if you wish to wander along the river and visit several châteaux, you will probably want to rent/hire a car for a day or two. You can usually take delivery of your reserved car at or near any SNCF train station. TER trains connect Paris's Gare d'Austerlitz with Orléans in about 110 minutes, stopping at numerous towns along the way. Intercité trains run nonstop from Paris's Gare d'Austerlitz to Orléans and Amboise in about 90 minutes. In Orléans you can connect with TER Interloire regional trains to reach other cities and towns (see below). TGV trains connect Paris's Gare Montparnasse with the Gare de St Pierre des Corps near Tours, the largest city in the Loire Valley (map). In Tours you can connect with TER Interloire regional trains (see below) to reach other cities and towns. TER Interloire regional trains run all the way from the Atlantic coast at Le Croisic via Nantes, Angers, Saumur and Tours to Orléans, connecting with local trains to Langeais, Amboise, Blois—Chambord and Beaugency. Ouibus, isilines and eurolines intercity buses connect Tours and Orléans with other cities in France and Europe. 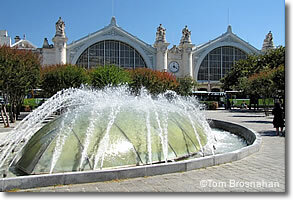 Gare de Tours SNCF, the main train station in Tours, France, but not the station for TGV trains from Paris, which use the Gare de St Pierre des Corps SNCF.